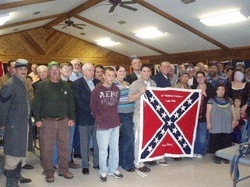 Camp #227 attended the Brigade Meeting in Dixie on Dec. 12, 2008 where the Hurley SCV Camp received their Camp Flag. 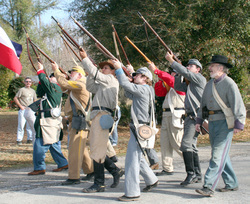 Members of Camp #227 marched in the New Augusta Christmas Parade on Dec. 20, 2008 in New Augusta, MS.
Members of Camp #227 marched in the Sertoma of Laurel Christmas Parade on Dec. 6, 2008. 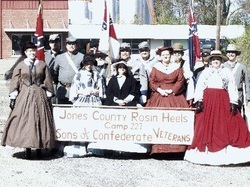 Members of Camp #227 helped the Gainesville Volunteers SCV Camp with their Juniper Grove Memorial on Sept. 21, 2008 near Poplarville, MS..
Members of Camp #227 help make up the 27th Miss. 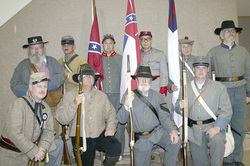 Honor Guard at the Southern Heritage Conference on Aug. 17, 2008. 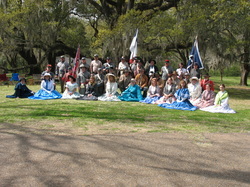 Camp #227 helped make up this impressive participant's photo at Routhland Plantation on March 22, 2008. 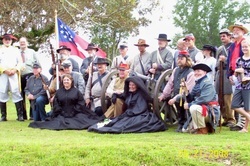 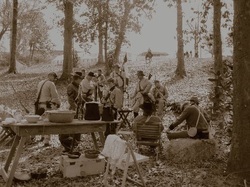 Members of Camp #227 get ready to battle at the Lucedale Reenactment at the Park on March 1-2, 2008 in Lucedale, MS.